A Model C impacter system has been installed into the fully refurbished production site in Lye, West Midlands to further enhance the facilities available to our customers. Impacters operate on the basis that two bodies of equal mass are accelerated towards each other at the same speed. When they collide the reaction forces are equal and opposite to each other concentrating the complete absorption of energy within the bodies themselves. When forging stock is placed between the bodies, it is deformed by the impact energy created by the blow. The impact energy is preset and is regulated by precise timing controls to provide consistent energy levels for metal deformation. Savings are made because only the required amount of energy is used for the size and complexity of the product being manufactured. Sawn billets are loaded into a hopper which transfer’s them onto an automated production line. The billets are directed through a Radyne induction heater to heat the bars to the required temperature which are then picked up by a custom robotic arm system called the pallet feed. It is hydraulic servo driven and precisely locates the pre heated forging stock into the appropriate die locations. The combination of programmable energy levels, blow patterns and the programmable stock handling features mean the impacter is a fully automatic production system that has no reliance on manual manipulation skills whatsoever. Only contact between the stock and the die occurs, helping to provide a longer die life and a more consistent forging. Clients can be certain they will achieve a more uniform product, an efficient manufacturing process, using less energy compared to other forging processes, and consistent, high volume production of excellent quality forgings with improved lead times. We believe that the introduction of the impacter production facility will result in the lowest possible production cost for medium to high volume forging in the UK. Horizontal Impacter Forging is the latest addition to our manufacturing capability. A Model C Automated Impacter has been installed at our manufacturing site based in Stourbridge, increasing our capacity to 16 hot forging cells. This process can achieve a more uniform product, using less energy compared to other forging processes. 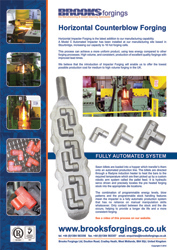 High volume, and consistent, production of excellent quality forgings with improved lead times. 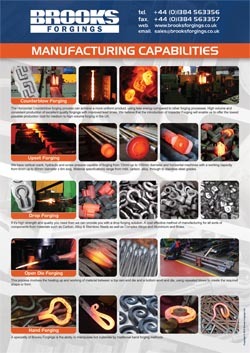 A brief overview of the Counterblow Forging process, our capacity and suited products.